A true legend never dies. Not many words are needed, or could describe the loss that the world of metal suffered at approximately 7:45am on Sunday May 16. Metal lost its messiah, its patron saint. Ronnie James Dio. The name rings with such deep power and meaning to those who have loved metal such as I have. 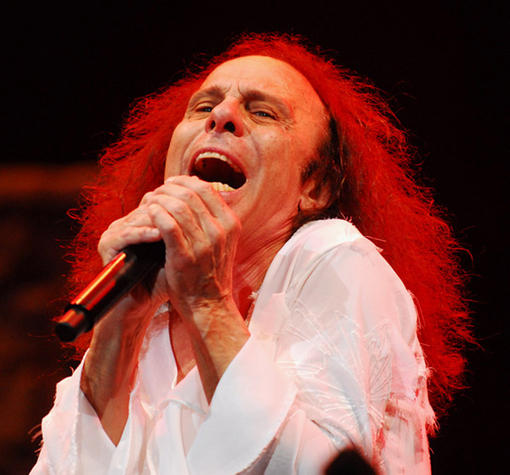 Raised on the metal from the era in which Dio reigned supreme, his voice has always had a special place in my heart. Too young to have lived when Elvis did, I can’t imagine it felt much different than Dio’s passing today. When I heard the news that the terrible rumors of his death had been confirmed, I put on Heaven and Hell while sitting in quiet sadness. For the first time ever, I felt personally sad when I heard news of the loss I had no personal connection with. As the day has passed, thoughtful remarks and anecdotes of Ronnie have flooded in – each showing Ronnie’s true and incredible character as a human being. I’ll not waste more words trying to convey his greatness both as a person and as a musician – we all know his potential knew no bounds. Rest in peace, Ronnie – it appears your demons have let you go. Your voice will live on forever, like a rainbow in the dark. This entry was posted in Updates and tagged elf, heaven and hell, rainbow, RJD, ronnie james dio. Bookmark the permalink.